YOB, the Oregon-based trio that Pitchfork proclaimed “one of the progressive acts of their generation,” will release Our Raw Heart, the band’s eighth full-length album and Relapse Records’ debut, on June 8. The news of the seven-track album’s release arrives as the band confirms a North American tour, kicking off June 14 at 89th Street in Oklahoma City. 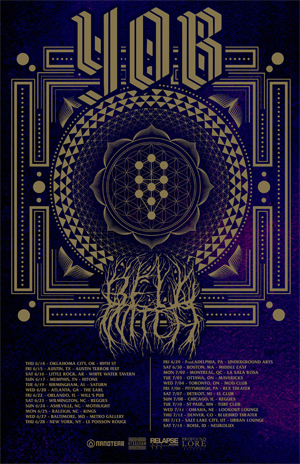 The outing, which will feature direct support from BELL WITCH, also includes performances at Austin Terror Fest and Mutants Of The Monster 2018. A full list of confirmed tour dates is available below. Our Raw Heart was co-produced by the band and Billy Barnett at Gung Ho Studio in Eugene, Ore., with mastering handled by Heba Kadry (THE MARS VOLTA, DIAMANDA GALAS, SLOWDIVE). Pre-Orders for Our Raw Heart will be available April 10 via Relapse.com. YOB recently reissued their fifth full-length album, The Great Cessation, in December via Relapse. That album can be streamed via all digital retail outlets and ordered via Relapse.com.